We’ve spent the whole month of May admiring the Chinese Houses blooming in Mother Nature’s Backyard. It’s been a busy month - getting ready for the formal opening of our garden in early June. So it’s a relief to finally share this favorite plant with all of you. 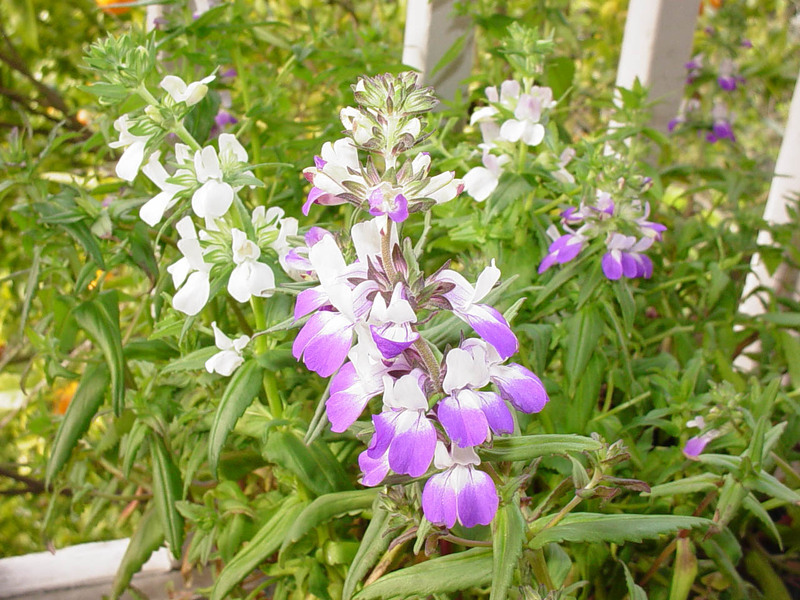 Chinese Houses (Collinsia heterophylla) is one of many California native annual wildflowers. It once grew throughout the California Floristic Province (west of the Sierras). Locally it still grows in the Santa Monica Mountains and on the Palos Verdes Peninsula. It once also grew in the lowland areas of western Los Angeles County, including the coastal prairie areas. It may once have been found near the Dominguez Slough (Gardena Willows Wetland Preserve), where Mother Nature’s Backyard is located. Chinese Houses are somewhat unique among our wildflowers - they like shade. Most native annual wildflowers are sun-lovers. Shade adaptations provide Chinese Houses with a unique niche in nature – and a great opportunity for home gardeners to use native wildflowers in their shady gardens. In nature, Chinese Houses grow on north-facing slopes and in the bright shade of tall trees. In Mother Nature’s Backyard, we grow them in a narrow bed under our espalier trees. This north-facing bed is protected from the hot afternoon sun by a tall block wall and is watered by our french drain. As you can see, Chinese Houses thrive here. They do well on bright shaded patios and in the open shade under trees. They also make great plants for large pots (see photo). Several Collinsia species are native to California. All are annual wildflowers and all look somewhat similar. The common name ‘Chinese Houses’ comes from the fact that the flowers, stacked in rows along the stem, vaguely resemble Chinese pagodas. At any rate, Chinese Houses bear some of our loveliest and most exotic-looking native blossoms. If you love purple, this is a wildflower for you. The flowers are intensely purple and white, resembling elegant garden snapdragons. See them once and fall in love! We did. 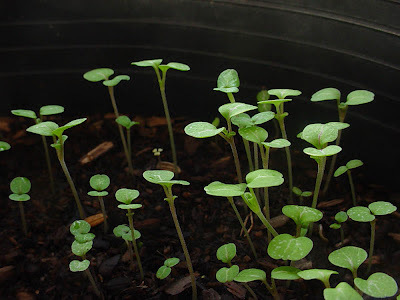 Chinese Houses are not difficult to grow from seed, which is available from mail-order native seed sources like the Theodore Payne Foundation (see the Where to Buy Native Plants page on this blog). Seeds can be planted directly in the ground (probably the best choice) or started in small, deep pots and planted out later. We started this year’s Chinese Houses in tall Styrofoam drinking cups (we re-use and then recycle them). Next year we plan to direct seed. Like many native wildflowers, the seeds are small. You’ll need to just barely cover them or rake them in lightly. The seeds need light to germinate. Cover them too deeply and they won’t sprout. Annual wildflower seeds are best planted in the late fall or early winter, preferably right before a significant rain storm. The rain water – and uniformly moist soils – help the seeds to germinate and the young seedlings to grow. Chinese Houses, like all wildflowers, need plenty of water until they flower. In El Nino years, the rain may be adequate. But you’ll need to water your seedlings when hot winter winds dry out our soils in a hurry. Once your wildflowers are blooming you can taper off the water. Chinese Houses need dry conditions after flowering to allow them to produce viable seeds. Give them this and they’ll re-seed beautifully. Many gardeners wonder about the proper mulch to use with annual native wildflowers. The answer is ‘none’ or a 1” deep layer of gravel, fine crushed rock or decomposed granite. An inorganic mulch helps conserve water and hides seeds from seed-eating birds. It also gives your wildflower areas a finished look even in the ‘off’ season. Many seasoned gardeners can attest that wildflowers grow best under an inorganic mulch – even if that mulch is meant to be a pathway! Chinese Houses have an interesting gardening history. Their seeds were brought back to Europe in the 1800’s where they were an almost instant success. They were treasured plants for cut flowers and cottage gardens. In fact, Chinese Houses were a popular plant in Victorian era children’s gardens, no doubt along with other easy-to-grow favorites. The lesson of Chinese houses is a good one: our native annual wildflowers are exotic and beautiful. We ought to include more of these ‘exotic’ local treasures in our home gardens.